SIC will be sharing our process, methodology, cases and solutions from our experimentation work over the coming months. We hope it will inspire similar work throughout Europe, creating a common voice for social change. We start by sharing our methodology. Financial instability, resources crisis, political disengagement and pressing unmet needs lead us to a need for new ways of thinking. Organisations and communities are showing an increasing ability to find practical and innovative ways to deal with difficulties they meet locally whether they have the legal competence to do so or not. Many practitioners and policymakers are looking for ideas and solutions to address issues and problems and meet citizens’ needs. These solutions may have been addressed and managed successfully before in other places. Social innovation opens a more collaborative and inclusive way to find solutions that meet people’s real needs, a creative process with the aim to deliver new solutions to a challenge. These solutions (products, services, models, markets, processes etc.) will “simultaneously meet a social need (more effectively than existing solutions) and lead to new or improved capabilities and relationships and better use of assets and resources” (TEPSIE). Framing the challenge properly is the first step to finding the right solution. There are many methods in social innovation for both framing the problem and searching out and defining solutions. This document describes a method of how to set up a process of social innovation based on the SIC experimentation. Collaborative and open: this principle is based on the fundamental idea that a diverse group of people participating in a solution-seeking process enables varied views, experiences and skills. Consequently, this enables cross-fertilisation of ideas and eventually generates better solutions. Thus, it is crucial to identify the different groups of people and their particular roles in each challenge, encouraging and enabling their collaboration throughout the process. Iterative: social innovation models seek to adopt an approach to idea development and practice where solutions are continually revisited, adapted and refined around a series of feedback loops, to fit the reality in their context. Diamond shape: in creative processes, a number of possible ideas are created (‘divergent thinking’) before refining and narrowing down to the best idea (‘convergent thinking’). This can be represented by a diamond shape and can happen several times in the process – to confirm the problem definition and to create the solution. One of the greatest mistakes is to omit the first diamond and end up solving the wrong problem. 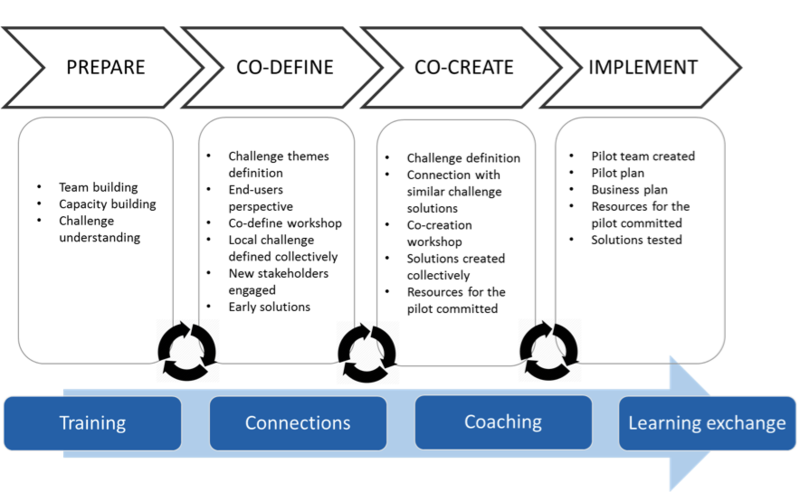 Coaching approach: the process facilitators provide advice and direction along the process based on their experience with social innovation tools and methods. Stakeholders and end users are the experts on the specific issues, challenges and existing solutions. Peer-to-peer learning: participants involved in the process are encouraged to share their own experiences, their knowledge and expertise. They interact with other participants and facilitators to attain training goals. Peer-to-peer learning is enabled by creating the spaces and facilitating the dynamics to a knowledge exchange to improve efficiency, support in the process and enhance collaboration as well as to build responsibility and self-esteem. Facilitator: in a social innovation process the organisation supporting the process, the facilitator, is not necessarily the ‘owner’ of the challenge. The host centres in SIC were not social innovation experts but intermediaries in a leverage position to support a new way to find solutions to local issues. The SIC social innovation process aimed to build on their existing skills and capability in order to master social innovation processes. Stakeholders: individuals or organisations with an interest or concern in the local challenge or issue. Providers of services tackling the issue of some of its parts – local authorities, charities, private service providers, end users, associations, research organisations and intermediaries are some examples. Some of the stakeholders will be unusual suspects as they don’t currently identify themselves as social innovators due to a lack of awareness of the concepts or language of social innovation. Support partner: in SIC the support partners are experts in social innovation tools and methods. The host centres were trained and supported by them in order to become designers and facilitators of social innovation processes in their regions. Challenge owners: the community, organisation or collective who have the rights and/or duties over the challenge. A social innovation process consists of a sequence of activities that seeks to find solutions to a specific challenge. The process itself brings a new approach that has social impact in its means (process) and ends (solution). By developing a social innovation process, apart from the better solution created, other outcomes that have social impact are achieved such as common and shared better understanding of the local issue by a wider group of local stakeholders, communities’ capacity building, citizen resilience, new alliances, teambuilding or wider engagement locally. It was important for the host centre, facilitator of the process, to take the time properly to explore the challenge and the range of possible solutions with an engaged group of stakeholders. The core team was formed by the host centre and these stakeholders. Setting up a core team with people with different perspectives of the challenge and potential funders of the solution was key. The host centre trained the stakeholders in the core team. They learned about social innovation principles, tools and methods in order to ensure everybody was on the same page, felt confident and could support the process. The SIC Handbook, a training toolkit produced for the experimentation, provided the host centres with social innovation tools and methodologies. The core team went through an exploring process to better understand the current challenge and be able to define and draw up a clear, engaging and positive challenge question that would be brought to the co-define workshop. This included research and interviews to know more about the challenge, engaging key stakeholders –including potential funders of the upcoming solutions – and end users in the process, looking at other innovative solutions to similar challenges in other places and understanding the end users perspective. The stakeholder interviews led the core team to a thorough research on the challenge, defining the challenge themes or questions they wanted to bring to the co-define workshop where they would facilitate the discussion with a wider group of stakeholders, key people and end users. The handbook, again, provided the host centres with a source of tools to design the workshops format and select tools. The co-define workshop aimed to bring together various perspectives in order to better frame the challenge and therefore ensure the solution achieve a bigger impact. The collaborative and open approach enabled a multi-disciplinary perspective that allowed a wider understanding of the challenge and the aspects of the issue to focus on. People’s concerns and priorities were shared and early solution ideas raised. The output of this workshop was a concise description of the specific local challenge based on a shared understanding of the challenge. In SIC the local challenges identified and defined were cross-cutting challenges affecting many EU countries (refugee integration, urban revitalisation, families in risk of eviction, holistic public services and lack of job opportunities for young people). Consequently, the results and solution ideas can be shared with other places facing similar challenges and achieve a bigger impact. In this phase, the core team leveraged the outputs of the co-defining local challenges workshop by engaging new stakeholders and revisiting the findings of the research done previously with new insights and contributions. Eventually, the team improved their understanding of the challenge background and emerging solution ideas. Once the core team refined the local challenge they designed and delivered three days of co-creation workshops which brought together local actors from the public, private and third sectors to co-create social innovation solutions to address the defined challenges. Other social innovators could inspire participants by showcasing examples of how they had addressed a similar challenges. New innovations would raise or may trigger an exploration of their potential for scaling or replicating into the local context. Again, the SIC handbook provided the host centres with tools and methods to design the co-creation workshops. Relationships built along the process so far allowed at this point to commit the resources needed for the implementation of the solutions on a pilot basis. In this phase, the chosen solutions were supported through an intensive innovation development process. The host centres supported the actors who had created the solution idea and would actively develop pilots for the different solutions: prompting a reflection on new findings around the challenge; developing a business plan; connecting them to key actors, potential funders and doers; finding funding resources; enabling new alliances and partnerships; exploring similar successful solutions. It was critical at this point to have an enthusiastic and engaged group of stakeholders that would bring the idea to life. Resources became key at this stage. In the previous phases, potential funders had been identified and encouraged to get involved in the pilot of the solutions. However new funding sources might be needed. The tools used by the host centres were based on accelerator methodologies. In SIC support partners trained the host centres in the methods before delivering independently with their support. These methods included the tools in the SIC Handbook. It was a hands-on learning process in which they were actually running their own activities and events along the process, adapting it to their organisational and local context and learning from it. Complementing the support the host centres benefited from learning exchange activities where they could share their experiences with the rest of host centres and other support partners.